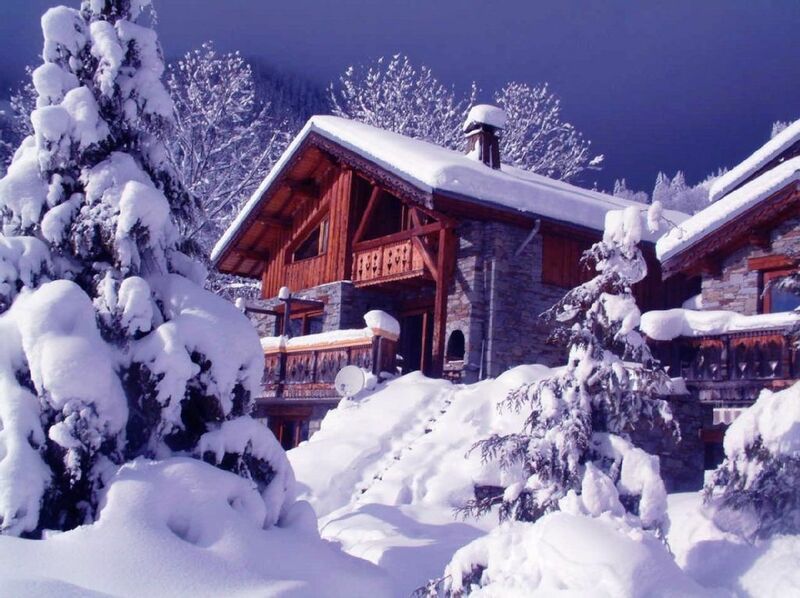 Chalet Sapiniere is just 400m from the pistes and village centre. A large stylish chalet with a mixture of traditional and modern décor, rough plaster walls done in the local Champagny style are complemented by beams, archways and decorative carpentry. It has a traditional farmhouse kitchen with brand new appliances. The spacious living and dining room has large picture windows and sliding doors onto the elevated terrace and balcony. There is a log fire in natural stone with plenty of seating for 14 people as well as a few bean bags scattered around. During the day, sunlight streams in through the windows and patio doors giving a tremendous feeling of light and space, yet if you close the curtains and light the fire the ambiance created is warm and cosy, perfect for your winter nights. It has amazing facilities for a self catering chalet with access to a beautiful indoor Swimming Pool, Jacuzzi and Fitness Suite. Also a large games room with table tennis and pool tables. Champagny Village: Champagny is an authentic mountain village with a character that still reflects its ancient farming origins. Tiny paths link old farms and chalets in a village where traditional Savoie life and modern tourism mesh seamlessly together. The village has a lively atmosphere with shops, bars & restaurants within easy walking distance. At night, Le Timbale, Les Rochers & Jackie’s bar are the main focal points for drinking and dancing with live bands and D.J.'s. Skiing & Boarding at Champagny: A cable-car whisks skiers to the Champagny ski area (2000m) in just 7 minutes which is where you’ll find the nursery slopes. Three brilliant long blue runs are great to learn on and progress to while advanced skiers can zip on to the superb off piste either side. You have a choice of two red runs to take you back to the village at the end of the day. Champagny offers direct access into La Plagne, but is less busy, so is much quieter and more pleasant, especially during peak weeks. Skiing & Boarding at La Plagne: The whole ski area covers 210km of finely groomed pistes in one of the biggest interlinked ski areas in Europe. With over 100 blue and red runs to cruise down, most skiers and boarders can travel vast distances around the 11 villages. Some very long black runs descend the Bellecote Glacier (3250m) both on and off piste, into the pretty tree lined valley of Montchavin. There are also numerous mogul fields in the area and a board park in 'Plagne Soleil'. Established in 1992, Barrelli Ski, owned by Steve and Emma have been running this chalet catered and self- catered since 1999. We currently run this chalet exclusively catered. An indoor swimming pool and spa were built in 2010 adding another dimension to this already fantastic chalet. Our two boys were born in 2005 and 2007 and learnt to ski in Champagny and Les Houches where we also own a fantastic 15 person chalet - Rocky Mountain. We have lived in various places in the UK and now love living near sandy surfing beaches in beautiful Cornwall! Chalet Sapiniere is in a beautiful situation in a real French village - a fantastic ski resort in its own right with links to practically unlimited skiing and snowboarding. It has a fast, modern lift system and reasonable ski pass prices and various lesson and ski pass deals. In essence, we fell in love with Champagny because it has the best of both worlds - a fantastic ski area but also a natural charm and ambience which makes it different to many mass marketed more touristy French resorts. It is in a stunning setting with beautiful views from the chalet and indoor swimming pool which both look across to the snowy mountains of Courchevel. We are a small family business with nearly 30yrs knowledge and experience, so we really feel we have finely honed our product over many years. Our top priority is providing high quality food and service at very affordable prices. Additional shower rooms and toilets (bathrooms 8 & 9) are available in the sauna suite and swimming pool. Champagny has own excellent ski area and ski school. * IMPORTANT NOTE * Price is a catered price per person and includes, breakfast, afternoon tea and 3 course evening meals with wine. Discounts available for children, depending on season and group numbers. The swimming pool, sauna, music room and pool table are shared with its sister chalet (Marmotte). N.B. No smoking in chalet, ashtrays provided for terrace outside, good chance to look at the fabulous views! We had an amazing stay, the skiing conditions were perfect, the Barrelli Ski staff were delightful and the food absolutely delicious! We were very well looked after, nothing was too much trouble, just don't challenge Mike to a table tennis game!! The on site facilities are amazing, in particular the swimming pool with the incredible views across the valley. The ski hire shop Barrelli Ski recommended were also very good and the free overnight equipment storage makes walking to and from the chalet a piece of cake. The walk up hill in the mornings isn't too bad either, we treated it as a gentle muscle warm up and you have a little mountain stream to keep you company. The village is nice and compact and typically French - boulangeries and local artisan shops, a lovely old church with a leaning tower and plenty of bars to choose from - although we got to like the 'Code Bar' where a lot of the locals tended to hang out. The Timbale opposite was good for live music (although we got a Queen tribute act :) !!! They weren't that bad actually! The skiing was excellent, Champagny links directly in with the La Plagne ski area and you can be in La Plagne Centre in just 20 mins (although we preferred staying over in the Champagny sector as it was a lot less busy). You can also be at the top of the Roche de Mio by catching just 4 lifts starting from Champagny village. We felt it was very well conected and the nursary slopes for the little'uns well placed at the top of the gondola. Our kids also loved Marie, their ESF Instructor. We have had some dodgy instructors with the ESF over the years, but when we were booking we were informed the Champagny ESF was very good. And we agree! We had a fantastic holiday and will definitely recommend staying with Barrelli Ski to our friends and family. Hope to see you next year. From the very start, Chalet Sapiniere and the amazing Barrelli Ski team worked hard to make each of us feel welcome, fully engaged in making our holiday easy and enjoyable, 100% achieved - Thank you Team Sapiniere. Our food was prepared and delivered professionally – can honestly say, there was not one choice on the menu that I didn’t like, dinner times were yummy (as were the daily cakes). The property was warm, cosy and well maintained. There was plenty of room for each of us. I really enjoyed relaxing in the Pool, Sauna and Hot Tub after a full day on the slopes. Chalet Sapiniere, is located in a great spot for easy access to all facilities in the town and the lift up to the slopes. A Fantastic Place To Be !! What a fantastic place in a small village of Champagny en Vanoise!!! Chalet Sapiniere and Barrelli ski have been excellent which has made this years ski holiday with friends a memorable one!!! The hosts were kind, hard working and a "nothing is too much trouble" attitude which has made our stay a truly relaxing and enjoyable one. The food was great and the chalet itself was clean, tidy with a warm feel to it plus with the swimming pool and hot tub, it's made this a truly relaxing place to be after a great day of skiing!!! Would I go again....ABSOLUTELY!!! This has been our 2nd year and just keeps on getting better!! This chalet was perfect, I've been so impressed. Let's start with the location, it's less than a ten minute (downhill) walk from the ski hire shop/ restaurants, and lift. It looks over Savoie with breathing taking views from the two double sliding doors of the south facing rear of the chalet.Within 5 minutes is a delicious boulangerie, a SPA for essentials, and this chalet sits off the main road so it easy to find. The area was quiet, serene and very relaxing. A perfect getaway. Now for the chalet, it held 14 of us with such ease, not to mention with warmth and comfort. The beds were comfy and snug, just what we needed after a long day on the slopes. The chalet was warm, during the night we could even afford to open the window for some fresh air. The underfloor heating was an absolute joy – no tip toeing around cold floors. No thank you. With several bathrooms queuing was not a problem at all. The downstairs hosts a huge but snug seating area, which could entertain 14 of us , but also just two when needed. All whilst having the backdrop of the mountains from the huge windows onto the balcony. There is wi-fi to photo message envious pals back home of the digs, food, and the views. Adjacent to the sitting area is the dining area, which was able to effortlessly sit 14 around it's huge table. This leads me onto the food which was simply outstanding! 10/10. The day started with the table laid with fresh baguettes, scrambled eggs, boiled eggs (to your preference), baked beans, butter, a gazillion slice of cheese, meaty stuff ( I ate veggie), cereals (muesli, cornflakes, choc cluster things – the lot), orange juice, apple juice, tea, coffee... you get my drift. It was plentiful and the perfect start to the day. As for dinner, well, that was something else. Where does one start? We kicked off with a different tasty starter every evening from blue cheese salad, to mushroom topped bruschetta (tomato for one person who politely declined mushrooms). Mains – well I ordered veggie, which is what I will comment on. I had salmon, trout, mussels, sea food stew, prawns, veggie lasagne– each meal was cooked and prepared beautifully. My meals were carefully prepared separately, and certainly not as an after thought. Finally, dessert, again was delicious, and as ever plentiful. There was not one mouthful of food that was not well received by anyone during this week. Finally, the crème de a cream was the pool downstairs, with breath taking alpine views. Chalet Sappiniere and Barrelli Ski were great hosts for our ski holiday. We were a group of 14 adults and the chalet hosts could not have been more helpful. The food was great and we all had a great time. Would recommend the location and the ski company. 1 hour from Chambery Airport, 2.5hrs from Geneva Airport, 3 hours from Lyon Airport and only 20 minutes from Moutiers Railway Station, Champagny en Vanoise is an authentic village ski resort directly linked into the huge Paradiski ski area (La Plagne and Les Arcs). It is also just a 15 minute drive from La Tania, Courchevel and the 3 Valleys. The chalet is just 400m from the pistes and lifts and 350m from the village centre, with all its bars, cafés, restaurants and shops. At the foot of the ski lift is the ski hire shop we use, where you can leave all your ski equipment, enabling you to walk to and from the chalet in your normal shoes. ***IMPORTANT NOTE*** PRICES QUOTED ARE PRICES PER PERSON - NOT FOR THE WHOLE 14 PERSON CHALET. IT IS A FULLY CATERED PRICE which Includes, breakfasts, afternoon tea and cakes and 3 course evening meals including wine and a cheese board. STAFF have one night off, usually Wednesday. We provide breakfast on that day for you to serve yourself and afternoon cake, you clear up yourselves that day. All the other days, we cook and serve you and clean up for you. We give generous child discounts - to calculate child prices deduct £100 for children under 14yrs. Other discounts may apply depending on holiday dates and numbers. Bedding, bed linen, towels & cleaning are included in price. Cots & high chairs provided upon request. WEEKEND/PART WEEKS AVAILABLE IF YOU CANCEL YOUR HOLIDAY Cancellations must be advised in writing and signed by the person who signed the booking form or paid the deposit. Cancellations are accepted as from the date written confirmation is received by Barrelli Ski Ltd. If you do cancel, the amount of notice you need to give us before your scheduled departure date and the cancellation charges we apply are as follows: i. More than 56 days....……….loss of the deposit. ii. 28 - 56 days...............………..50% of the holiday balance. iii.14 - 28 days..................……..75% of the holiday balance. iv. Less than 14 days……………..the total holiday cost. See Barrelli Ski website for full terms and conditions .